The scenic view of the mountains may not be the most attractive element of this interior. 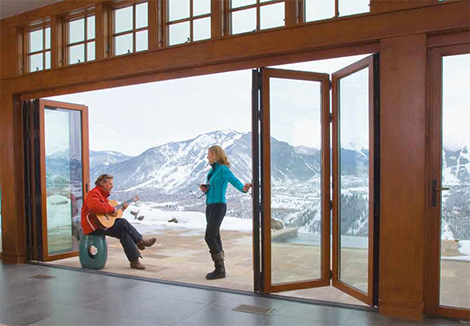 I’m partial to the modern, folding doors that line the room’s back porch. The wooden doors fold accordion-style, allowing virtually the entire back wall to serve as an exit to the outdoors. Huge glass panes ensure everyone has a great view of the mountains. If their eyes make it past the doors, that is.